We’d love your help. Let us know what’s wrong with this preview of The Open Bible by Anonymous. To ask other readers questions about The Open Bible, please sign up. Over rated, underwhelming and taken way too seriously. This is my first time using one of Thomas Nelson's "Open Bibles", and although not my ideal version of a study Bible(I haven't found the ideal yet),it has elements that I would want. My favorite feature of this 'Open Bible' is the way the cross-references are interspersed throughout the text, immediately following the verses to be cross referenced, instead of being in a middle column where it takes more time to find them. I must admit, though it may seem weird, I love this feature! I like seeing This is my first time using one of Thomas Nelson's "Open Bibles", and although not my ideal version of a study Bible(I haven't found the ideal yet),it has elements that I would want. My favorite feature of this 'Open Bible' is the way the cross-references are interspersed throughout the text, immediately following the verses to be cross referenced, instead of being in a middle column where it takes more time to find them. I must admit, though it may seem weird, I love this feature! I like seeing the references(and related/supporting verses) WHILE reading the passages, instead of having to stop, notice the verse reference I'm currently on, and then locate it in a center column in order to find the cross references. In this Bible they're right there 'in' the passage as you're reading along, thus the "Read-Along References". The introductions and outlines of each book of the Bible are a nice feature, giving you a high level over-view of each one before you delve into it. I also like the charts in the "visual survey of the Bible", especially in regards to the division of Israel and Judah. It has timelines, and shows who was a prophet to which Kingdom and when, and also has the Kings of Israel and Judah listed in parallel columns. Though this Bible has some manuscript variants listed, it doesn't have as many as I'd like. For instance, when you come to Psalm 40 verse 6, "Sacrifice and offering You did not desire, My ears You have opened." Despite there being a reference to Hebrews 10:5-9, there is no footnote giving the LXX rendering of the verse "Sacrifice and offering You did not desire, but a body You have prepared for Me" which version is quoted by the author of Hebrews. 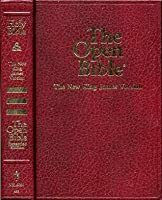 I would recommend the Open Bible as an excellent cross reference tool, a great addition to any study Bible collection. 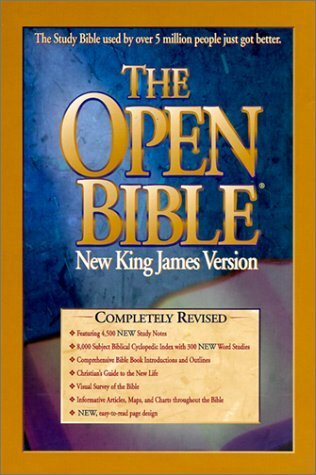 To expound on what I said earlier, my personal ideal of a study Bible would be a mix of the Open Bible(it's Outlines, "Read-along References" and charts), the Zodhiates Hebrew-Greek Key Word Study Bible, The Apostolic Polyglot Bible(for the keyed LXX), and the NIV(the surprisingly large listing of textual variants, though I would like more). This has been my primary bible for 20 years. I love the new King James Version. It's readable but still reads like "the bible". Tis particular bible also has a lot of resources and study helps. it does not have the verse by verse commentary like a study bible. I also love my New Living Translation and other versions but this is my personal bible of choice. My favorite bible in my favorite translation. I can find a specific passage in this bible easier than any other bible I own. There are additional features in this study bible that are indispensable I serious bible study. A great resource to own and use.